A strategic objective of the Global Vaccine Action Plan is to extend immunization to all equitably, yet this is far from reality in many middle- and low-income countries. A mother’s education level, household economic status and urban–rural divides are some of the factors that contribute to inequitable coverage. It is difficult to assess equity, particularly given challenges with collecting data sub-nationally in many countries, let alone at service delivery points, or the lowest level of the health system. A recent assessment of the Global Vaccine Action Plan says 74 countries (38%) do not report immunization coverage data of high enough quality for sub-national comparisons to be made. To address these needs, VillageReach is developing a framework for assessing equity in the design and configuration of an immunization supply chain. An initial draft was developed in the context of potential supply chain modifications for remote and hard-to-reach areas. It was used to identify areas of a country – in this case districts – that may need closer attention from an equity perspective. The framework helped identify disparities between districts, show how proposed supply chain changes such as direct delivery or new warehouses could reduce disparities between districts, and assess the results in the context of immunization coverage and socioeconomic factors. Districts with insufficient cold chain coverage per fully immunized child face supply chain inequity, as they are unable to store sufficient quantities of vaccines, including buffer stocks, for their target populations. Health facilities only can receive as many vaccines as their cold chain storage capacity allows, which may be insufficient for the target population. And it is difficult ensure the quality and potency of vaccines without enough cold chain to maintain a proper temperature for all vaccines. District stores and health facilities further from resupply points may face supply chain inequities because vaccines are at higher risk of spoilage. This is typically due to inadequate cold chain transport or longer transport times, which may also impact vaccine potency. Long distances between supply points and health facilities may also make it harder to respond to outbreaks, emergency orders, or even adverse weather. These two supply chain equity metrics are based on distance and, hence, better suited for rural areas since distances in urban areas are unlikely the main factor for measuring responsiveness to emergencies or outbreaks. In partnership with the government of Pakistan, UNICEF and Gavi, VillageReach used these metrics to consider equity while optimizing the immunization supply chain in Pakistan. To assess if there was sufficient cold chain storage available, VillageReach developed a cold chain benchmark for Pakistan to assess the current cold chain coverage per fully immunized child. First, the WHO vaccine volume calculator was populated with the country’s policy on shipment frequency, cycle stock and buffer stock to assess cold chain necessary for the entire district. This was calculated to 0.06 litres per fully immunized child and is the “benchmark” for districts in Pakistan. Then, using capacity data of cold rooms and ice-lined refrigerators available at district stores and health facilities, VillageReach aggregated the cold chain available at the district store and the health facilities, and compared it to the benchmark. This is outlined in the below chart. In Pakistan, if a district’s cold chain coverage was below the benchmark, as indicated by a red bubble, it was recommended to assess the cold chain of health facilities in that district and prioritize them during the next phase of Cold Chain Equipment Optimization Plan (CCEOP) deployment. The cold chain coverage benchmark will be different for every country depending on the vaccine schedule, vaccine volumes, buffer and cycle stock policies, and levels of supply chain, all of which are used as inputs in the WHO vaccine volume calculator. Districts with less cold chain coverage than the benchmark would be unable to store enough quantities of vaccine. A benchmark also can be calculated for health facilities, to highlight which specific health facilities may need more cold chain. Other indicators, such as average resupply distance between vaccines and EPI centers, and inbound resupply distance of vaccines to the district store from a higher level of the system were also evaluated as outlined below. The most current data set was from the Pakistan Living Standards and Measurement Survey (PLSMS) 2014-15, so this was used to review coverage across the country. Based on the range from 100% DPT3 coverage at the high end, to 6% coverage at the low end, categories of green, yellow and red were created corresponding to 100th, 90th, and 70th percentile groups. This translated to 100%, 91% and 72% percentiles as shown in the illustration below. Similarly, groups based on percentile were calculated for urban rural disparities in DTP3 coverage with a range from 0 to 74 percentage points. The same PLSMS survey also highlighted women’s primary school attainment, a known factor in children’s health, including immunization services. So percentiles were calculated based on a range from 3% to 73%. The table below shows the corresponding green, yellow and red categories for this indicator. In order to achieve equity in vaccine coverage, vaccines must be both available and potent whenever a caregiver reaches a point in the health system where immunizations are provided. 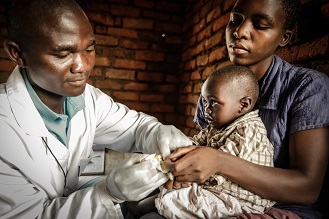 Measuring equity and addressing it in the immunization supply chain is a challenge given the lack of previously used metrics as well as limited access to data. However, it is possible and important to make every attempt to do so. 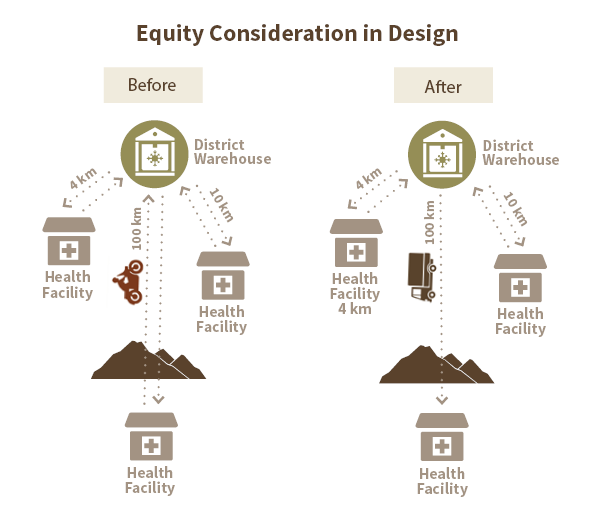 This initial framework is one step toward helping ensure equity is at the forefront of decision-making when it comes to supply chain design. It was shared with immunization supply chain partners for review and feedback, and will continue to evolve as it is applied in more settings. VillageReach also will expand the framework and include metrics for use in urban areas in the future – it is our hope that the communities full of children with the greatest needs are prioritized first. If you have ideas about how to strengthen this framework, or would like more information, please email Mariam.zameer@villagereach.org. Where actual data on cold chain was not available, it was assumed that at least 60liters of net cold chain capacity was available at these sites.